Palestinian citizens of Israel, joined by their Jewish Israeli supporters, demonstrated against the Jewish Nation-State Law in Tel Aviv’s Rabin Square. 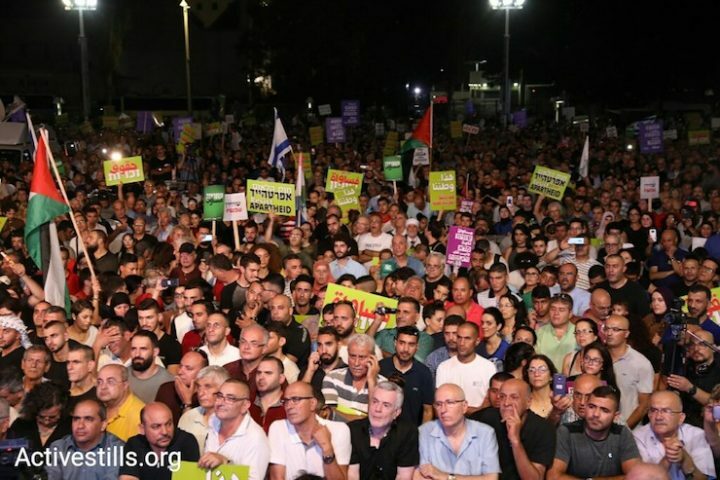 Over 30,000 Palestinian citizens of Israel and their supporters demonstrated in Tel Aviv’s Rabin Square Saturday evening against the Jewish Nation-State Law. The protest, organized by the umbrella organization of Palestinian citizens in Israel, was one of several actions taken against the law, including petitions to the High Court of Justice as well as smaller demonstrations across the country. Saturday’s protest came a week after tens of thousands of Druze citizens came out to Rabin Square to protest the same law. 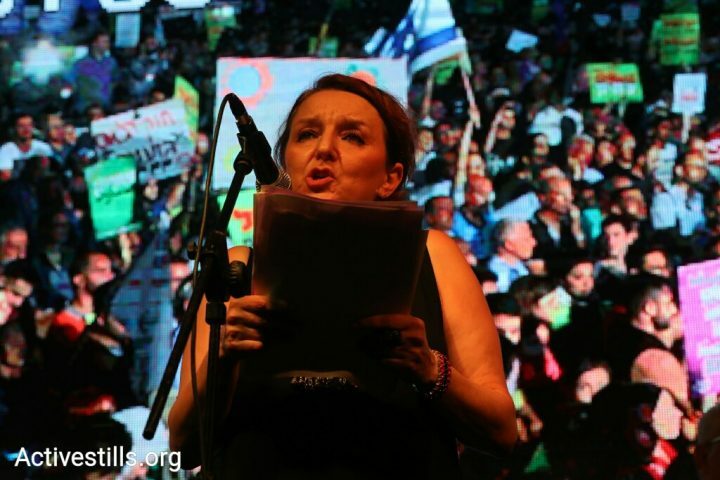 Although the protest was set to begin at 7:30 p.m., thousands had already converged on Rabin Square hours earlier. Hundreds of Muslim protesters also took part in a mass prayer prior to the beginning of the rally. Protesters flew both Israeli and Palestinian flags, despite an earlier controversy among activists around the presence of national symbols at the demonstration. 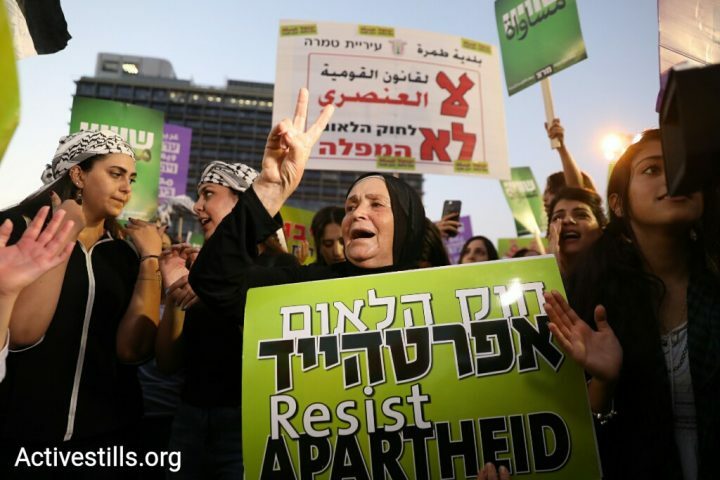 Shortly after 8 p.m., the demonstrators began marching toward Tel Aviv Museum, while chanting slogans against racism and fascism in both Hebrew and Arabic. Twenty-six political parties, movements, and civil society organizations, including the Association for Civil Rights in Israel, Peace Now, Sikkuy, Mossawa, and Amnesty International, called on the public to participate in the event. Hundreds of buses headed out from 70 different locations across the country, including from Druze and Bedouin villages. The march ended with a rally outside the museum, and included remarks by Arab High Monitoring Committee Chairman Muhammad Barakeh, prominent Israeli sociologist Professor Eva Illouz, historian Professor Kais Firro, and Haaretz publisher Amos Schoken, among others. “Not all Arabs and Jews think the same. 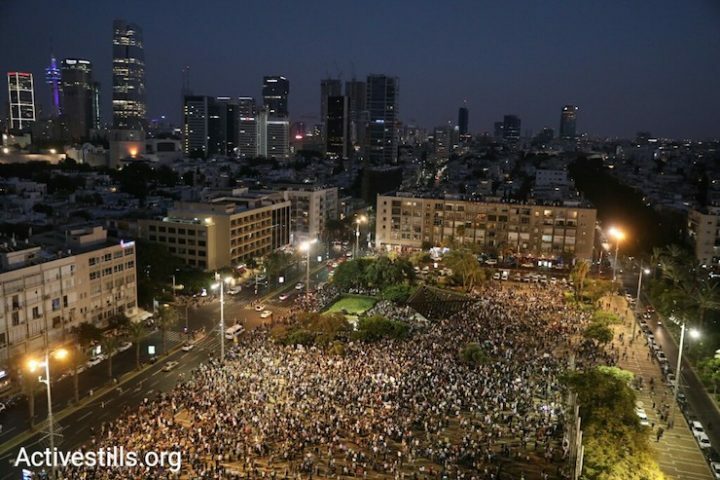 But all the Jews and Arabs here came out in droves to the square to wipe out the abomination and erase the stain of Netanyahu and his government’s Jewish Nation-State Law. We will also erase the stain that is his government,” Barakeh told the crowd. Prime Minister Benjamin Netanyahu, Culture Minister Miri Regev, Labor Chairman Avi Gabbay and others criticized the protest, after photos showing demonstrators waving Palestinian flags went viral. Meron Rapoport contributed to this report.